This article questions some of the basic principles of arboriculture, tree care and cultivation. It considers pruning, questioning its benefit and the impact it might have on a tree’s physiology and ecology. It also raises some questions about the long term impact of pruning and the need to appreciate the natural life span of trees. However, this article makes no attempt to provide any answers, because the point is we should be questioning our actions, and the motives behind them, constantly striving to care for trees in the true spirit of Arboriculture. Arboriculturalist or Arboriculturist - is a person who cultivates trees. Improve, develop, cherish, to care for, are all terms used by the Oxford English Dictionary, to describe Cultivate or Cultivation. Arboriculturalist or Arboriculturist which ever you prefer to use, they are words that will always be a mouthful at the best of times, so an abbreviated Arborist, is often used and has been commonly adopted. Arborecology – combines Arboriculture with Ecology in a holistic approach to tree care with consideration to the arboreal ecosystems that trees support and within which they grow. The first question, when considering pruning, is whether cutting off and removing living branches will actually benefit the tree? Will the proposed pruning prolong the tree’s useful life expectancy within the context of the surrounding environment and land use? It is important to remember that pruning can quite easily do more harm than good, and in some situations may create more problems than it solves. In fact, does the tree ‘need’ to be pruned at all? Every cut made has the potential to change the growth characteristics of the tree. Removing living foliage, by pruning, affects the trees physiology and future productivity. The reduction in leaf area that results from pruning will reduce the tree’s overall photosynthetic capacity, which is likely to affect sustainable growth on the pruned section, or the entire tree. Pruning can therefore have a lasting impact on the viability of the tree and can directly influence its longevity. One of the major limitations of crown pruning is that it has a very one-sided impact on tree physiology. Before pruning the tree will be maintaining a natural equilibrium of growth, throughout the crown of leaves and branches, in balance below ground within a broad spreading system of roots, with their associated mycorrhiza. Raw materials are absorbed from the soil, moved up through the transport system within the trunk and branches to the leaves, where energy is produced through photosynthesis. By removing leaves and branches from the crown the arborist disrupts the balance, forcing the tree into a state of turmoil. The casual observer, of the growth that appears after pruning, could be mistaken for thinking that cutting off branches and reducing the tree’s leaf area is beneficial and encourages new vigour. This may indeed appear to be the case, but it is essential to remember that severely pruned trees will initiate the production and growth of ‘water-sprouts’ or ‘sap-risers’, as a response to the need for new foliage to readdress the balance of photosynthetic capacity and energy requirements. To sustain this flush of growth the tree must draw on stored energy reserves, which limit the resources available to resist infection, disease and decay. For arborists, charged with the responsibility of tree care, the primary pruning considerations are those that affect the tree’s physiological condition, its ability to compete with pathogens and its durability within a wider ecological context. Pruning influences the trees physiological productivity: its ability to resist pathogens, its successful reproduction and its efficient use of natural resources. So, how often does the advice provided by arborists benefit the tree? 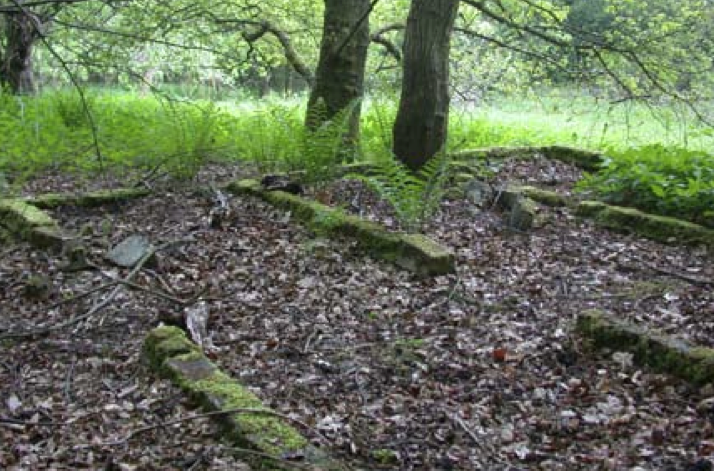 This photograph of trees growing through the ruins of an old house, illustrates that ultimately nature will have the last word. 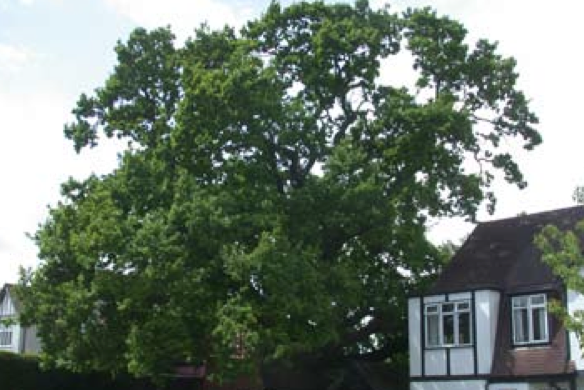 This impressive ancient oak pollard, is growing in a rear garden of a residential property in West Wickham, Kent. The tree is thought to be in the region of 600-700 years old. Residential houses now surround the tree, which has been swallowed by the urban sprawl of London’s 1930’s suburban development. 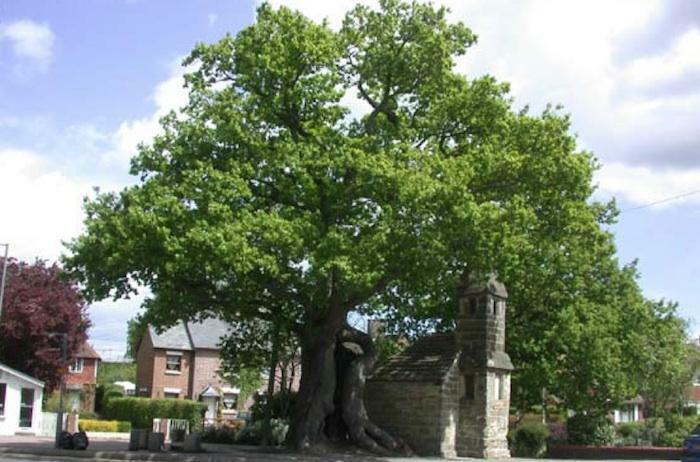 The houses either side have been given planning permission by the local authority to build extensions, which have placed more pressure on the tree and the responsibilities of its owners. The neighbours now complain about the tree, which blocks light from their gardens and bedroom windows. In most cases the real motivations behind tree pruning are associated with the human values of visual aesthetics, amenity and recreation. This may, in part at least, be due to our need to see trees as being worth something, to have some purpose or function, which we as humans can use. Whilst the management of trees using pruning practices such as pollarding have enhanced their longevity, these techniques are now less frequently used as the need for the associated resource has reduced. These trees may now be seen to have some historic significance, but their true value is in their importance as an ecological resource of co-evolutionary organisms. The primary considerations of pruning specifications are all associated with the impact pruning will have on the tree, but if tree care is the drive behind pruning, how does the tree actually benefit? The answer is more often that the tree does not benefit, with the exception perhaps of formative pruning during the establishment stages, which may improve the structural form and stability of a tree’s trunk and branch growth. However, even this is a human interpretation of ‘good’ structural form. Pruning must therefore be considered within the context of understanding tree physiology over time, while taking into consideration the ecological impacts. The point is that although the instigation behind tree pruning is associated and inextricably linked with human values, the implications have a direct impact on the physiology of the tree and the ecological balance within its environment. The arborist must, as a person responsible for tree care, work with a knowledge, understanding and respect for the arboreal ecosystem and not just the tree which happens to be the subject of the pruning specifications. This is arborecology. Arborecology incorporates an appreciation of the ecological value of trees and an acknowledgement that they might have some intrinsic value, because they support a diverse arboreal ecosystem, which is an essential part of the natural world to which we all belong. Informed management decisions can enhance their longevity with sympathetic pruning, but sometimes to maintain a sustainable ecological habitat within populations of trees it becomes necessary to consider destructive techniques to encourage the process of decay. Trees are one of the few organisms which have an average life expectancy that exceeds our own (human) ‘three score years and ten’, yet we offer them very little respect for this achievement. In fact, trees figure so low on the day to day agenda of modern life that the average person will rarely stop to consider their value. However, when someone actually pauses to think of the contribution trees make to their lives as an individual, or as a member of society, the list can appear endless. There is a growing recognition that trees have a part to play, from the calming influence they have on our everyday lives to their ability to sequester carbon- dioxide, which could influence the sustainability of human survival on the planet. Many of these beneficial attributes are linked to the slow progression of tree growth over their long life spans, which can frequently be measured in centuries. However, many trees are deprived of the opportunity to live out their natural lives, because of a human ignorance that inflicts its will on the world with an arrogance that fails to recognise that everything is intrinsically connected. The technological advancement of human society has created populations of people who have lost track of their cultural connection with an area or community, to the extent that they shuffle around their country and sometimes the world, moving from place to place. 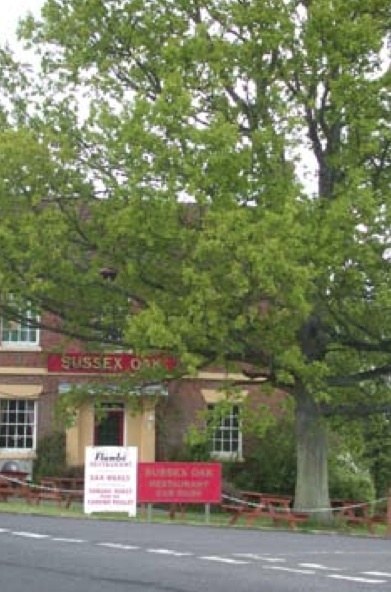 Is it any surprise then, that the new owner of a suburban residence has no qualms with felling an oak tree, which may have been planted over 100 years ago during an era he/she feels no connection with? The person who fells the 100 year old oak, fails to appreciate its value and considers that his/her rights, to live in a place without trees, are greater than the accumulative values and benefits of the one oak. 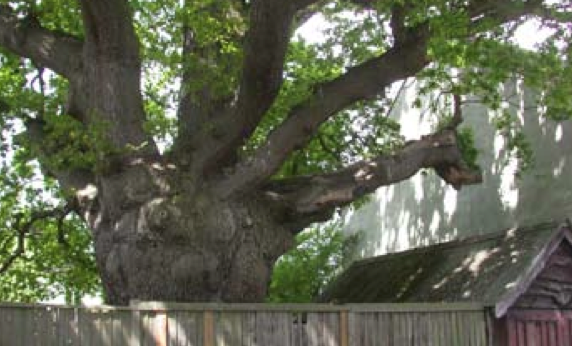 However, the same person may only live in the property for no more than a decade, less than a tenth of the trees age. Which of the two has, earned or deserves the greatest right to life? Was the tree used to mark the boundary before the cross was built? Was it used as a hanging tree? 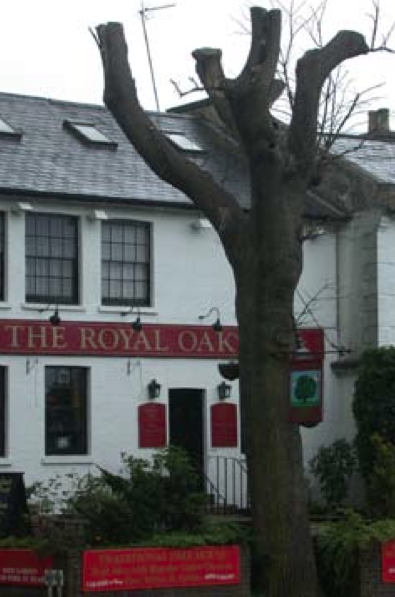 Royal & Sussex Oak These two pictures need no words to explain them, simply to say; where would you rather spend a sunny summers afternoon? In this over populated modern world there have to be compromises to maintain some degree of harmony, and if we are to life in association with trees the compromise is pruning. There is rarely space in our crowded towns, cities and even villages, for the mature size of trees. Some form of pruning has to be considered to readdress the balance, but just because they are perceived to be growing in the ‘wrong’ place, does that mean they have lost their value? A tree may be deemed to require pruning because it is considered to be ‘too big’, a ‘hazard’ or simply growing in a location where it is at odds, or out of context, with the surrounding land use. However, there is no reason to ignore its potential life expectancy, and the ecological values associated with it. Pruning work must be completed with an understanding of the physiological limitations that impact on the tree’s ability to react to the loss of living foliage. Pruning is all about compromise! The reactive capacity of a tree will be compromised to some degree, depending on the pruning techniques employed, and the volume of living wood and foliage which is removed at any one time. When making pruning decisions the arborist must consider the chronological age of the tree, because a tree in its formative years may be able to tolerate the loss of a large limb, but the same tree in full to late maturity might suffer terminally when inflicted similar treatment. An arborist who is responsible for large populations of trees, such as those owned and managed by local authorities or large parks and gardens, must guard against the use of generic pruning specifications which do not take the trees chronological age into consideration. It is also essential that the same arborists keep records of these tree populations, and how they have been managed. This will ensure continuity in the way in which trees are cared for. Generations pass while some trees stand, and old families last not three oaks. It is well established now, through the work of mycological researchers like Lonsdale, Schwarze, Boddy and Raynor that many plant pathogens co-exist for extended periods of time, in harmony with their host. Although the full significance of this has yet to be interpreted from the observational research completed to date. The concept that the organisms we consider to be pathogens (and therefore ‘bad’) offer a positive contribution to the arboreal ecosystem, does not require a ‘leap of faith’ or great foresight. However, it is equally important that we do not jump to conclusions. Thoughtless pruning can interfere with and interrupt the natural balance between symbiotic and parasitic relationships within the tree and associated arboreal ecosystems. The physiological, pathological and ecological impacts of pruning work will not be immediately apparent, because the tree and its associated ecosystem will react through adaptations which occurs over a period of years. Arborists must consider this when assessing a tree by maintaining a cautious approach that is not distracted by the presence or absence of familiar and eye catching fungal fruiting bodies. A greater understanding and appreciation of the long life processes of trees is essential. An arborist responsible for the care of just one tree, can only hope to have an influence for a fraction of its potential life span. However the pruning decisions that the arborist makes, can have a direct impact on the tree and its sustainable life expectancy. A decision made today could have consequences that are experienced decades and possibly centuries in the future. Trees, as long lived organisms, are slow to react to changes in their environment. Our increasingly fast pace of life means that we can inflict change on our surroundings in quick succession. A tree, which may fall victim to this, will suffer stresses that could culminate in premature death after being forced into a spiral of decline. Pointless!? Come on Mick, do you take zero interest in the ramifications of work on trees that have been supporting the ecosystem for centuries before you were an itch? Read this article before Joe, if this was a political debate then posting it would be called virtue signaling. I dont really get what you mean there. I'm far from a purist when it comes to tree work, but the principles and theory need to be understood surely? I'll ask again, do you hold zero regard for the wellbeing of ancient specimens? Of course I do, but I differentiate between an ancient specimen, which, lets face it we work on very rarely if ever, and the sort of trees that 99% of us work on 99% of the time. I didn't read that article as being blatant posturing though. If more people tried to work more closely with the basic principles within it would go a long way to furthering the industry.